240 Volt mains electricity is getting ever closer for Berega. 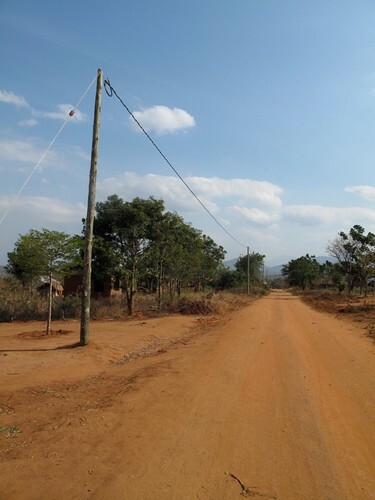 There are now Power Poles in the village (No NIMBYism here) with cable running between them. Sadly they are not connected to anything yet! It's hoped that by December this year it will be connected and the hospital at least will be able to enjoy the mains supply backed up by the new generator, which will switch automatically when the mains fails. That is if the hospital can raise the Tsh 5,000,000 (About £2.5k) required to complete the wiring. They have been given funds from an American charity to pay for the connection to the mains and wiring of the Out Patients Department, the Laboratory and the RCH (Reproductive Child Health) area. This leaves things like the wards, operating theatres and the School Of Nursing without mains supply. It is hoped the money can be raised as soon as possible to enable the hospital to benefit from the introductory discount. They would also like to connect the staff houses and enjoy the same discount offer but again funds do not allow this. There is no doubt that the installation of mains electricity heralds the dawn of a new era for Berega, let's hope and pray that it brings great blessing to the area. You are certainly keeping busy, look forward to updates of the teams arrival and the painting they will be doing together with Kingdom outcomes from the trip. Lazy Sunday Afternoon & Manic Monday!